Since first starting out as a blogger and affiliate marketer, I have used several web hosts, such as DreamHost, GoDaddy and Bluehost, and always with mixed results. A few years ago, I moved the majority of my sites over to DreamHost, initially on a Shared Hosting account, and later upgraded to VPS. That was one of the best decisions I have ever made in my blogging career. Although no host is perfect, and DreamHost isn’t either, they do offer most of what I would typically look for in a web host. I now stick with DreamHost, a no-nonsense hosting provider that delivers a good variety of hosting packages, decent customer support and excellent performance. DreamHost may not be the cheapest option out there, but they are not the most expensive one either. They provide a good balance between quality and affordability. This DreamHost review is a detailed guide to the main features of this reputable web host, their pros and cons and why (or why not) you should choose them. Let’s get straight to the point before I go into more details with this DreamHost review. DreamHost certainly isn’t for everyone, but I personally couldn’t be happier with them as my main web host. So here’s a quick summary of who would enjoy being with DreamHost and who would be better of going somewhere else. You are not afraid to get a bit technical, even though you’re certainly not a tech nerd. You typically don’t have to rely on tech support all that often. You appreciate some level of flexibility in your hosting account with options to easily change settings and configurations yourself. You want to be able to easily upgrade (or downsize) your hosting within your dashboard in accordance with the growth of your blog. You don’t appreciate dodgy sales tactics and constant promotions. You don’t need, or you don’t like, cPanel. You have very limited technical skills in regards to Internet, website management and blogging. You want tech support to always be readily available, either via phone or chat. You are a big fan of cPanel and absolutely need it. I’ll try and go through the above in more detail throughout this DreamHost review. Support is always a hot item when selecting a web host. Though you may find some negative reviews about DreamHost’s support policies, I am actually very happy with the support options DreamHost offers. Let’s get straight to the point. If you require immediate phone support from DreamHost, they will charge you $9.95 for a callback. Alternatively, you can pre-pay $14.95 for three callbacks per month. In other words, you cannot call them. They can only call you. For a small fee, that is. For many bloggers, this is a deal breaker. For me it isn’t, because I am not someone who needs technical phone support. It helps that I am a semi-technical person of course, but I personally find DreamHost reliable and stable enough that I pretty much never need to speak to any support representative. DreamHost does, however, provide chat support. This is free of charge but there may be wait times. It is also only available from 5:30AM to 9:30PM Pacific time, 7 days a week. I have used the chat support option only a few times for minor issues and was happy enough with the process. The other, much easier way to request support is by submitting a ticket. You can do this via your dashboard and you will typically get a good response within 24 hours, but sometimes much quicker. I have used this option several times and have always been content with the response. I would also like to point out that the very few times that I contacted DreamHost support, the response was always friendly, professional and actually helpful. Support can mean a lot of things. It can come in various forms. Some people need phone or chat support, others prefer resources online. Support is not just about being able to immediately call someone. It is so much more than that. A few years ago I tried calling GoDaddy about a hosting issue I had with my site. I did my best explaining the problem to the friendly support rep but no matter how hard I tried, she wasn’t able to understand the problem, let alone fix it. The conversation then turned into a sales phone call with her trying to upgrade my hosting account. It was hopeless. Mind you, this wasn’t her fault. It’s just that many web hosts hire first-line phone support representatives that are under qualified. And as such they can often only deal with the basic questions and issues. But these web hosts can claim that they offer phone support and that’s what it’s all about. It’s a commercial drawcard. The DreamHost Knowledge Base is an absolute delight. It’s a huge wiki-style collection of help articles that answers all the questions you may ever have. Literally every single action you can do in your DreamHost dashboard is clearly documented in their Knowledge Base. The same applies to every single issue you may encounter with your blog or hosting account. Registering domains, upgrading to VPS, installing SSL certificates, optimizing databases, moving domains to or away from DreamHost, paying bills, back-ups… Anything that you can think of and you will find it in their knowledge base. It’s awesome. Would you rather be talking on the phone with an under qualified first-line support rep, or have the solution clearly documented online? I prefer the second option. So even though some might say that DreamHost support is not up to standards, for me personally DreamHost support is one of their biggest drawcards. Because my expectations around support are perhaps a bit different from what others would expect. If you love cPanel and can’t go without it, unfortunately DreamHost is not for you. DreamHost has developed it’s very own control panel from where you can perform all actions related to your hosting account in a relatively simple and intuitive manner. It has been around for 22 years so you can be assured that it’s a very robust system. What I personally dislike about cPanel is exactly what I like so much about DreamHost’s control panel. It has a very minimalist design that gives you complete control over your websites and domains. Installing WordPress, or a different CMS such as Joomla, is as easy as it gets. 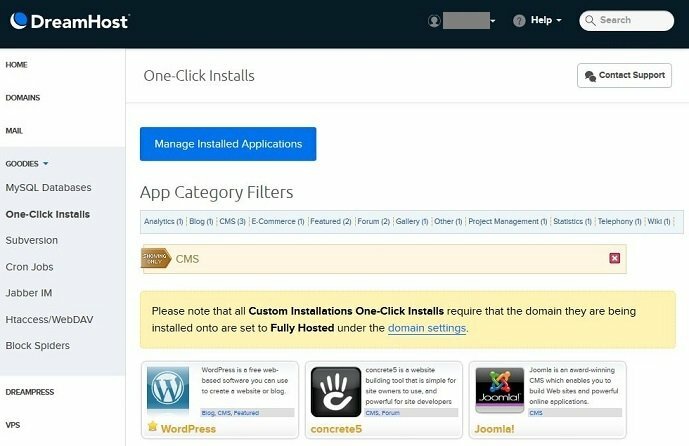 The DreamHost Control Panel offers One-Click Installs, so all you need to do is press a button to get DreamHost to install WordPress (plus database) for you. Even though the Control Panel does require a bit of getting used to (and a somewhat technical mindset comes in handy here), the flexibility and great range of options available to you as a customer make the DreamHost Control Panel a great asset. In addition, the DreamHost Knowledge Base explains everything about the control panel in great detail. The knowledge base is also directly available from within the control panel. 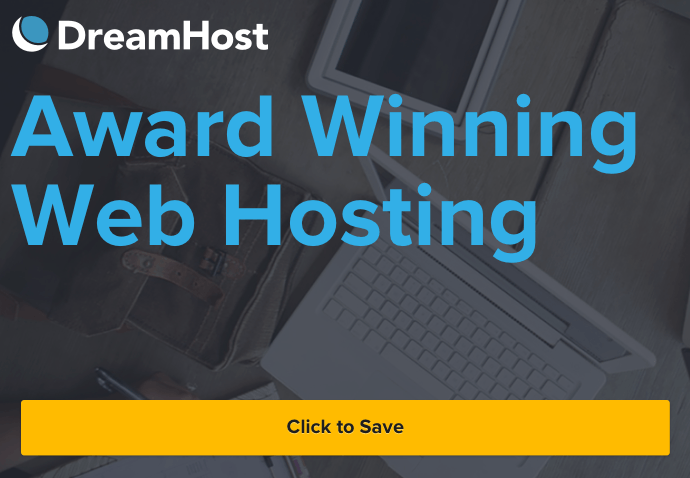 DreamHost offers a great variety of hosting plans, catering for different types of customers, from beginner bloggers to high traffic e-commerce sites. DreamHost’s shared hosting – also known as DreamHost Happy Hosting – offers simple yet powerful shared hosting with all your files stored on high-performance solid-state drives (SSD). If you sign up for an annual plan, you will also get one free domain name. In addition, you will get free domain privacy and an SSL certificate with each domain. Also, WordPress can be installed with a simple click of a button. There are no different shared hosting tiers, everyone gets the same powerful solution, with unlimited domains and email addresses. DreamHost also offers a 97-day money back guarantee if you’re not happy. Read more about Shared Hosting (from $7.95 per month). Earlier this year, DreamHost added a new, very basic, form of shared hosting to their range of hosting plans. This basic plan is called Shared Starter and is currently priced at $2.59 per month on an annual plan. 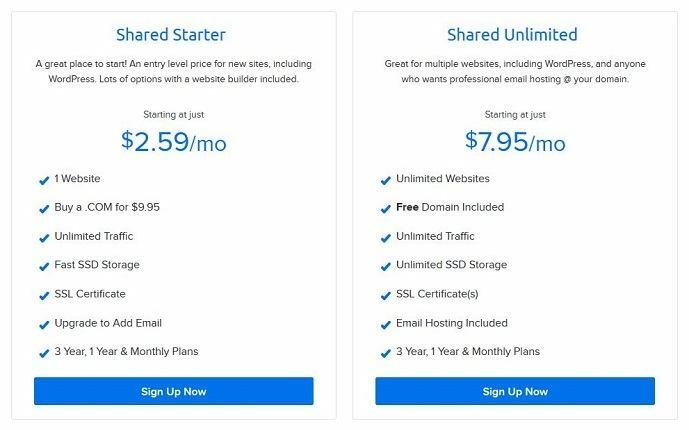 The Shared Starter plan is different from the Shared Unlimited plan in that you can only host one website and you also don’t get a free domain. In addition, it doesn’t include email hosting. This plan is perfect for the beginner and/or hobby blogger. You can always upgrade to Unlimited (or VPS, see below) at any time without issues as a DreamHost customer. If your blog grows fast and traffic just keeps increasing, it’s wise to move from Shared to a VPS hosting solution. On a VPS you will get your very own server resources, not hindered by any other websites. DreamHost offers four different VPS solutions, ranging from 1GB RAM and 30GB storage to 8GB RAM and 240GB storage. Each plan offers unlimited bandwidth and support for unlimited domains. You can easily customize your VPS from within the DreamHost Control Panel so that it suits the needs of your website(s). Read more about VPS Hosting (from $13.75 per month). A dedicated server is for the big guns, websites with an insane amount of traffic that require a lot of resources in order to run without issues and interruptions. A dedicated server with DreamHost starts with 4 cores, 4GB RAM and 1TB storage, which can be upgraded to up to 12 cores, 64GB RAM and 2TB storage. Read more about Dedicated Server Hosting (from $169.00 per month). DreamPress is DreamHost’s version of managed WordPress hosting in the cloud. The cheapest DreamPress plan comes with 10GB storage running on a Fast Cloud Server and can be upgraded to 30GB SSD storage. Keep in mind that you absolutely don’t need (the more expensive) DreamPress solution in order to run a WordPress website. You can do that with Shared, VPS or Dedicated as well. It’s just that DreamPress is highly optimized for WordPress and can handle growth without having to move to a different server. It also offers things such as pre-configuration and auto WordPress updates. DreamPress is great for bloggers without technical skills who just want to focus on publishing content. Or bloggers who simply don’t have the time to manage or optimize their servers. Read more about DreamPress Hosting (from $16.95 per month). I can only vouch for Shared and VPS hosting as I haven’t tried the other options yet. But I have always been extremely pleased with both Shared and VPS hosting so I have no reason to believe the other options wouldn’t be just as awesome. What’s great is that you can relatively easily switch between hosting plans from within your control panel. It’s typically just a matter of pressing a button to select a new plan and DreamHost will set it all up for you. What’s even better is that you can also make changes to your current plan, for example by adding more memory to your VPS or database server. DreamHost is also very pro-active in this regard. If your site is pushing the boundaries of your current hosting setup, DreamHost will email you options to upgrade. And they do this without resorting to dodgy sales tactics and unexpected up-sells. When I first started with DreamHost, I moved a few sites onto a shared hosting account. This worked really well and never had any major problems. Until a couple of these sites started growing fast at which point I upgraded to a VPS. I Initially moved to a VPS with 1GB RAM and 30GB Storage, and later upgraded to 2GB RAM and 60GB storage. Most likely I will upgrade again at some point next year as my sites keep growing further. Even though I was happy with how my sites performed in the shared hosting environment, the performance boost with the VPS was very noticeable. And each time I upgraded, the process was seamless. No downtime and no major issues that I was aware of. And that makes me a happy DreamHost customer. Okay, some people may not care too much about this, but I find it quite important. 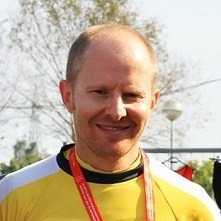 DreamHost has made it part of their company mission to minimize their impact on the environment as much as possible. They do so by investing in optimized facilities and committing to policies that put respect for natural resources at the core of what they do. LEED Platinum and EnergyStar-certified facilities. Data centers powered by grids that obtain electricity from renewable sources. Advanced lighting control systems with occupancy sensors. LED and low-mercury, high-efficiency CFL lighting. Ceramic cups, plates and real silverware in every single office and strictly no disposables. Financial incentives for employees to use public transportation. Recycling bins everywhere in every single DreamHost office. Isn’t that awesome? If every company would do that, the world would be a better place! To summarize this DreamHost review, let’s go through the pros and cons of hosting your websites with them. You can choose between a great variety of different hosting options. Also, upgrading or downsizing is very easy and seamless. DreamHost has a very extensive knowledge base that contains answers to all questions and issues you may have. It literally describes every single process related to your hosting account in detail. DreamHost’s servers perform very well, at least in my personal experience. My websites hosted with DreamHost have never had any serious load or down-time issues that I am aware of. This applies to both Shared Hosting as well as VPS Hosting. Pricing for all hosting options is very reasonable. Even though not the cheapest in the industry, it’s still very affordable and you get quality and flexible hosting in return for your investment. The DreamHost Shared Starter plan is very competitively priced. It’s perfect for those who are just starting out and/or for those whose websites are just a hobby. The custom-made DreamHost Control Panel is awesome. I find it very intuitive and it makes me feel like I am in full control over everything related to my websites hosted with DreamHost. DreamHost are very transparent and honest about the services they provide. As such, you won’t have to deal with any aggressive or dodgy sales tactics and hidden up-sells that you often see with other hosts. They care about the environment, a lot. There are restrictions around phone support. It’s only available as a callback option during business hours and it’s not free. For me personally this is not so much of a drawback but others may find this a deal breaker. DreamHost is not the cheapest option out there. But although you can certainly choose for a more affordable host, the quality of services offered may not be as good. I find the DreamHost pricing very reasonable. The help chat often has long wait times, although this highly depends on how busy it is at that particular time. I’ve used the chat option a couple of times and was always happy with the result, although at one occasion a bit of patience was indeed required. DreamHost doesn’t offer cPanel. Instead it has its very own control panel. Some bloggers however cannot live without cPanel which is why I mark this as a potential drawback. Hopefully this DreamHost review has given you some useful insights into what it’s like to have your site(s) hosted with DreamHost. If you’re just starting out as a blogger, one thing I recommend is that you do not just go for cheap. Cheap is cheap for a reason. Go for quality instead, and find a host that is able to easily cater for the growth your blog may go through in coming years. DreamHost offers you this flexibility, with affordable plans for shared hosting, VPS, dedicated servers and specialized WordPress hosting. So whether you’re a beginner WordPress blogger, a seasoned Internet marketer or a proud owner of a high-traffic e-commerce site, I can highly recommend DreamHost. Summary DreamHost offers a varied range of powerful and scalable web hosting solutions, from affordable shared hosting options for starters to professional VPS and dedicated server arrangements for high-traffic websites and blogs. While they don’t offer free phone customer support, they do provide decent online technical support backed up by a comprehensive online knowledge base. Your review on DreamHost left no stone unturned! You answered all my questions and curious thoughts. I am very impressed with your review, statistics, and information. Thanks so much for the information! Much success to you and your business. Have a great day!